Actually, it’s been only a few months. Less. But it feels like a year or two. And sadly, I’m not writing here to say that I’m back. Rather, it’s to let you all know what I’m doing. I’m writing a Web Novel. You may also think of it as a web serial, or a novella written in small, 1,000-4,000 word doses that I post every Tuesday and Saturday. 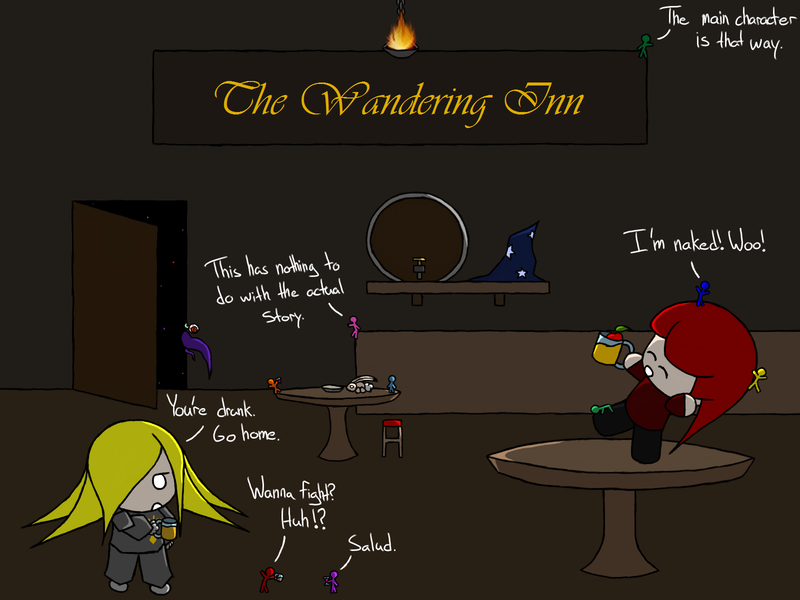 The genre is Fantasy and the name of the story is The Wandering Inn. I won’t do much advertising here. I’ll just leave a link and a picture that has nothing to do with the actual plot of the story. This is just a picture with Pirate and her friends having a party for old time’s sake. But if you’re interested in seeing what I have to write, check it out sometime. Right now I’m only 4 installments in, but hopefully I’ll keep adding to the story for a long while. …I mean, I’ve written two novels now. How hard can it be to write another? Writing is weird. Hope you’re all well. Stay out of weird inns. The real mystery is why any of this is a mystery. A Conan Doyle I am not. And Pirate is no Moriarty. In fact, I don’t think anyone would ever be taken in by her crimes. On the other hand, her willful use of violence to disguise her crimes has its own effectiveness. It’s a mystery to everyone. I’ve said it before and I’ll say it again: I want a cloud. I hate showering normally, but if I could shower with a cloud I’d do it every day. I’d just have to watch out for lightning bolts. From poetry and nice visuals to cold-blooded murder over graffiti. Yep, that pretty much sums up that blog. For the record, I don’t hate graffiti. It’s a really cool art form. I just hate graffiti on my stuff. Just humor him, and maybe he’ll sail away. Have you ever been attacked by one of those tiny dogs? You know, chihuahuas or a similar breed that thinks it’s immortal? I hate those dogs. I just want to kick them, mainly because they’re trying to bite me. But seriously, sometimes you just have to realize you’re a small fish in a big ocean. The weird thing is that this is reality. And we’re back to less graphics, more jokes. It’s really weird to me that doctors actually use super glue and tape in surgery. I feel like that’s wrong, but then again, I’m not a medical doctor. Yet. Some things aren’t worth the effort, Pirate. This new drawing style is taking longer than I’d like. And water is still really hard to draw. I might go back to my old methods in a while, but for now let me just say that I hate swamps. Anything could be lurking in those dark waters, and I for one don’t want to find out what’s down there.